We have also been working hard at resolving some bugs on the platform. Our Learning Services page lists the various services we offer for prospective clients. You can access our Learning Design Services on our pricing page. Our Contact Us page is now better equipped to allow us to be of better help to you. Once you select what your query is about, a more detailed contact form will be seen. This helps our team to collect important details about the issue so that we may resolve them right away! UI upgrades have been made to the text widget. Users can now search for course titles with single characters in them. Survey export functionality has been fixed and improved. The Random Spinner widget along with its completion settings are now running smoothly. Broken images in emails sent from our server have been fixed. As always, we are continually working on the site performance and releasing bug fixes! Like our new features? Or are you facing some technical troubles? 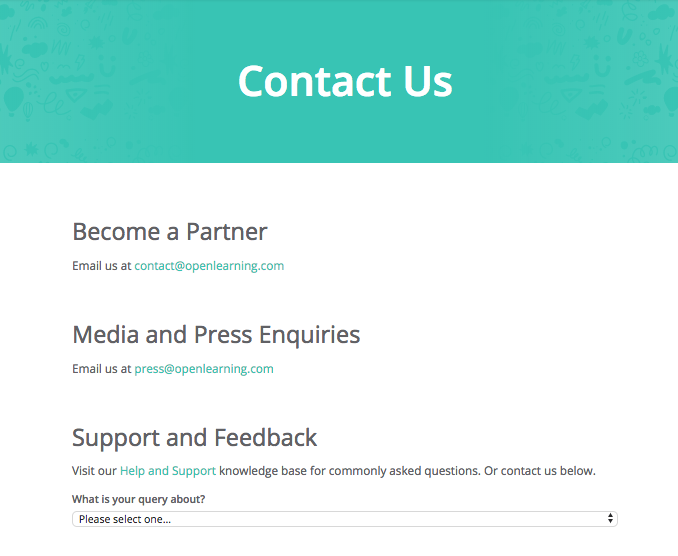 Email us at: support@openlearning.com.